Buying food in a foreign culture can be as intimidating as it can be exhiliaraing. A new country, more often than not, means new vegetables and fruits, some bearing only a slight resemblance to beloved favorites from home and others so different, they are a tad frightening. A new culture also presents new cooking challenges – a lack of an oven or only two burners on a stove, for example – not to mention different spices and sauces. Without a personal guide, the usually familiar terrain of supermarkets, green grocers and farmers markets suddenly becomes an alien landscape. Throw in an experimental purchase or two gone wrong, (“That was intestine?! ?”) and even the most adventurous may begin searching for the the local branch of an international fast food chain or grocer. 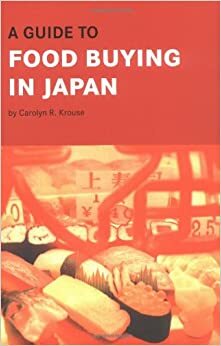 Enter Carolyn Krouse's book, A Guide to Food Buying in Japan (Tuttle Publishing, 1986). Just the gentle hand most new arrivals need and desire, Krouse's book is a no-nonsense reference that still holds merit despite being published more than 25 years ago. Many of the products she lists remain the same, as do the fish, vegetables, and fruits commonly available. New vegetables, such as zucchini, may well be familiar to foreigners in Japan, but the old guard – udo, daikon, kabu, komatsuna, and burdock – will most likely be strangers. Soba, udon, ramen, and somen with matching sauces and broths are a new world of noodle much different than the pasta many people know. Similarly, the wide variety of tofus, teas, rice, and other cultural favorites are all also briefly but well explained. Laid out in a handful of chapters focusing on different food groups as well as common cleaning supplies, Krouse includes photos and sketches of various items, as well as the kanji, hiragana, and katakana that might be needed. Enlarged illustrations of product labels – from food to cleaning products – are given with explanations of each item listed. The same is done for sale fliers and other commonly occurring signs found while out foraging for dinner. Krouse even includes a recipe or two and some advice to get people started in their new kitchens with a new set of pantry items. Those with food allergies will find reassurance in clear examples of kanji (with the associated pronunciation aids) for assorted fish, nut, and dairy items. Photos and sketches complement short descriptions of everything from fruit to vegetables to seaweed, with a seasonal chart of fish thrown in for good measure. Krouse also thoughtfully includes some basic Japanese the shopper will find invaluable such as “How much is it?” and “Is it in season?” She describes specialty shops found along every shotengai (shopping street), too, although these are fast disappearing despite better service, less packaging, and usually slightly lower prices with the advent of chain supermarkets and the arrival of big box style stores. She also lets readers in on a few handy tricks like finding baking soda (look in the drugstore rather than the supermarket) along with tips for quick substitutions (powdered cocoa and shortening can replace baking chocolate in a pinch) that will save cooking hassles galore. Her suggestion to visit department store basements with their vast selections of beautifully presented appetizers, main dishes, and desserts is a great idea for exploring and sampling new foods. Perhaps most wonderful for new arrivals as well as longer term residents, though, are the vocabulary lists (everything from additives to seaweed to drain cleaner is listed in English with corresponding kanjji, hiragana, katakana and a romanji pronunciation guide), recommended reading list (a bit dated but still useful), conversion tables, cooking terms, and counting terminology. A slim volume, A Guide to Buying Food in Japan, is meant to be easily whipped out when consternation and confusion strike. Krouse's brief explanations and definitions serve as an excellent starting point for those wishing to know exactly what it is in front of them. Users should keep in mind that this is a pocket reference, and that further knowledge of an item will require a bit of research, bumbling language efforts, and lots of smiling and laughter. While not answering every question a reader might have about a particular item, A Guide to Buying Food in Japan will certainly help transform the weird and new into old friends welcome in the household.